Here’s a rambling, comfortable country home that brings that country feeling to whomever builds it and to wherever it’s built. 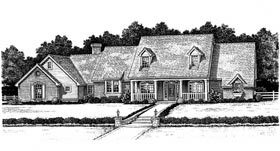 The home has the traditional country look of a place that’s grown over time, with the added-onto appeal of a variety of different-sized gables and a classic front porch. The main volume of the home is the large central structure that includes the porch and dormers. the porch delivers visitors through the main entry and into the Y-shape foyer, which branches out to the formal dining room, living room, or breakfast room/kitchen/family room space. The living room and formal dining room are probably more appropriate for entertaining, while the other shared spaces are more family-oriented. The family room is huge, at 384 square feet, and includes a fireplace flanked by built-ins. The family room is pen to the kitchen and breakfast area, which has a French door opening onto the rear patio, part of which is covered. The far left side of the plan contains the three-car garage, laundry, and a powder room. The far right side holds the master suite, featuring a large bedroom with coffered ceiling, adjacent sitting area with a door onto a private patio, and a very spacious bath with walk-in closet. To the front of the master suite is a separate, self-contained suite of bedroom and full bath, which could be used as a guest suite. The door to this suite is off the same private hall that leads to the master suite and contains a powder room. The upper level of this 3,064-square-foot home includes two secondary bedrooms, each with a walk-in closet, and a dual-use full bath.